Packaged Terminal Air Conditioners With Heat Pump Provide Dual Heating and Cooling Functionality For Commercial, Residential, Hospitality, and Indoor Industrial Locations . 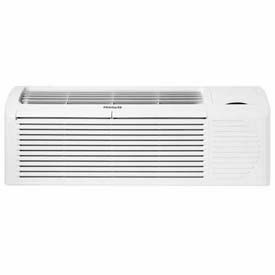 Packaged terminal air conditioners with heat pump offer optimal temperature and climate control for areas in need of sufficient temperature alteration. Dual functionality within unit features heating and cooling capabilities for energy efficiency and application versatility. Select units have a restart feature that automatically resumes operation at previous setting once power is restored. Sound reduction package within unit minimizes resonance levels for quiet operation. Protective fin coating offers corrosion resistance and lasting durability. BTU heating ranges from 6,000 to 17,000. BTU cooling ranges from 7,000 to 15,000. Select units are UL listed. Additional specifications vary per model. Packaged Terminal Air Conditioners With Electric Heat Provide Cooling and Heating For Residential, Hospitality, Commercial, and Indoor Industrial Locations. Packaged terminal air conditioners with electric heat offer optimal temperature and climate control for areas in need of an on-demand temperature changes. Dual functionality provides heating and cooling capabilities for energy efficiency and application versatility. Select units have a restart feature that automatically resumes operation at previous setting once power is restored. Select models feature a white noise function capable of masking sound level changes. Protective fin coating provides corrosion resistance and lasting durability. BTU heating ranges from 6,200 to 17,000. BTU cooling ranges from 7,000 to 15,000. Select units are UL listed. Additional specifications vary per model. PTAC Accessories Provide Easy Installation And Optimal Performance Of PTAC Unit. PTAC Accessories are made of several high quality materials to provide long lasting durability. Used for new construction installations, renovations, upgrades or replacement applications. 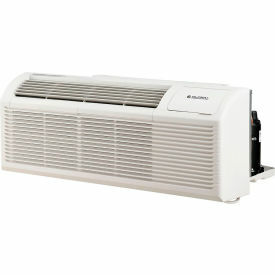 Easily install and modify Packaged Terminal Air Conditioner (PTAC) for high efficiency and dependable service. Wall Sleeves and Grilles are required for new construction installation. Replacement Filters are sold in packs of 10. 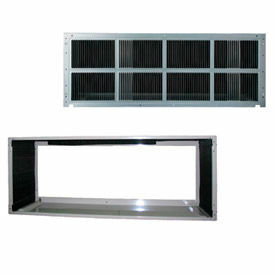 Easily replaces old filters to maintain high efficiency, low contaminant airflow. Thermostats help control units and set temperature levels. Allows wall installation. All GE PTAC 265/277V Power Supply, Connection Kit, and Sub-Base Accessories must be checked prior to purchase. Available styles include PTAC 15, 20 and 30 AMP and PTAC Architectural Grille in aluminum or polymer. Watts and dimensions vary per style. Please check local building codes and requirements prior to installation.